Cook fresh pears, lemon juice, sugar and fruit pectin briefly for this tasty pear jam. 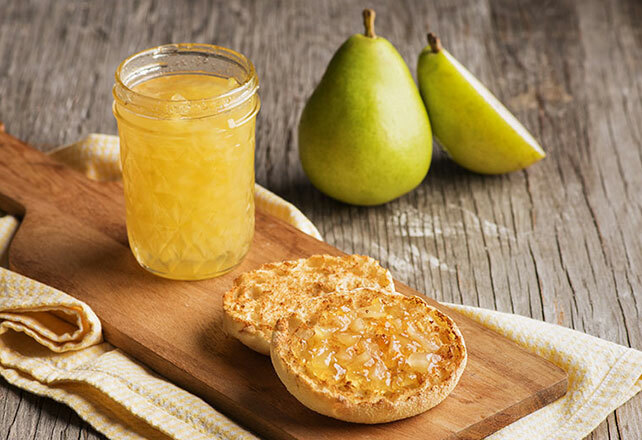 Use a canner for a SURE.JELL Pear Jam to add to your morning toast! Peel and core pears. Finely grind or chop fruit. Measure exactly 4 cups prepared fruit into 6- or 8-qt. saucepot. Stir in lemon juice. Stir in pectin. Add butter to reduce foaming. Bring to full rolling boil (a boil that doesn't stop bubbling when stirred) on high heat, stirring constantly. Add sugar; stir. Return to full rolling boil and boil exactly 1 min., stirring constantly. Remove from heat. Skim off any foam with metal spoon. At altitudes above 1,000 feet, increase processing time as indicated: 1,001 to 3,000 feet-increase processing time by 5 min. ; 3,001 to 6,000 feet - increase processing time by 10 min. ; 6,001 to 8,000 feet - increase processing time by 15 min. ; 8,001 to 10,000 feet - increase processing time by 20 min. Makes about 6 (1-cup) jars or 96 servings, about 1 Tbsp. each.